The White House has a vermin problem. A number of work orders at the White House show it is overrun with cockroaches and mice, which have taken up residence in the situation room as well as a mess hall in the basement of the West Wing, NBC reported. Mouse traps were also set outside Vice President Mike Pence’s outer office along with the ground floor of the West Wing. In addition to dealing with the pressures of the job, Chief of Staff John Kelly has to contend with a colony of ants living in his office. @StephGrisham45 @WhiteHouse Are Christmas decorations supposed to give you creeping anxiety and a feeling of lingering dread? Plenty of the work orders were mundane requests to hang up TVs, replace light bulbs, and fix leaky faucets in the White House, which is now more than 200 years old. Other instructions shine a light on the ways in which the Trumps are making the White House their own. The Oval Office was also deemed “too cold”, with one request asking that the temperature be raised by two degrees. Trump, who reportedly called the White House a “real dump,” called for renovations in the West Wing. 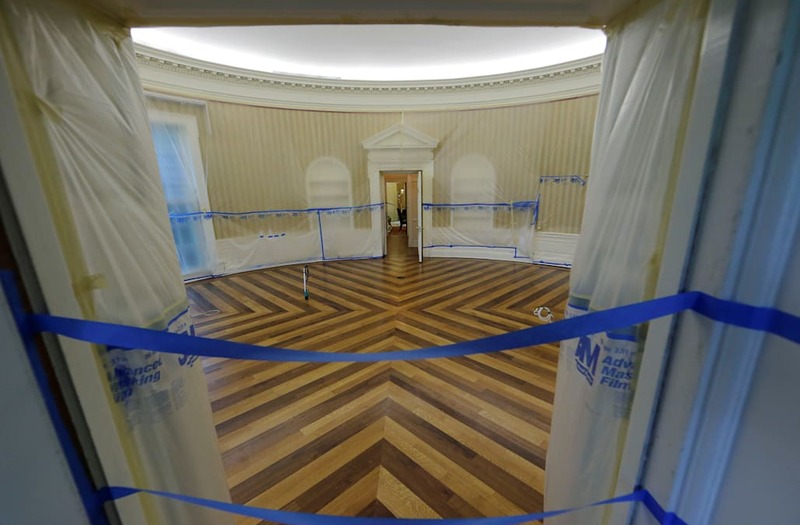 In addition to new wallpaper, the Oval Office was notably fitted with gold drapes.